Not to be confused with Marymount College or Loyola Marymount University. For other uses, see Marymount (disambiguation). 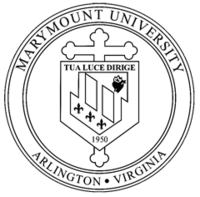 Marymount University is a Catholic university with its main campus in Arlington, Virginia. Marymount offers bachelor's, master's, and doctoral degrees in a wide range of disciplines. It has approximately 3,375 students enrolled, representing approximately 44 states and 76 countries. Marymount was founded in 1950 by the Religious of the Sacred Heart of Mary (RSHM) as Marymount College, a two-year women's school. It was a member school of the Marymount colleges operated by the sisterhood in New York, California and several other states. The campus was located on the former estate of Admiral Presley Marion Rixey, Naval Surgeon General and personal physician to Presidents Theodore Roosevelt and William McKinley. Classes and activities were centered around the former Rixey Mansion, renamed as the university's "Main House". Marymount became a four-year college in 1973. It added master's degree programs in 1979, and its first doctoral program, the clinical Doctor of Physical Therapy, in 2005. Its first male students were admitted into the nursing program in 1972, and the college became fully coeducational and changed its name to Marymount University in 1986. The university established the Center for Ethical Concerns in 1993. In October 2010, Marymount celebrated its 60th anniversary with the grand opening and ribbon cutting ceremony for Caruthers Hall, a 52,000-square-foot (4,800 m2) academic facility focused on the sciences and health sciences, and Rose Benté Lee Ostapenko Hall, a 77,000-square-foot (7,200 m2) residence hall providing apartment-style housing for 239 students. The Malek Plaza is a gathering area between the two buildings and features a statue of Sister Majella Berg, RSHM, who was president of Marymount from 1960 to 1993. A sky bridge connects the new buildings to the rest of the campus. In August 2017, Marymount opened Ballston Center. The LEED Gold Certified multi-use complex comprises a nine-story academic/office tower and The Rixey, a 12-story residential/retail building, each boasting multi-level underground parking. Ballston Center is anchored by a public plaza and the Reinsch Pierce Family Courtyard. Marymount University is accredited by the Commission on Colleges of the Southern Association of Colleges and Schools to award doctoral, master's, and bachelor's degrees. The school grants bachelor's, master's and doctoral degrees, undergraduate and graduate certification, and pre-professional programs in teaching, law, medicine and physical therapy through the Schools of Design, Arts, and Humanities; Business and Technology; Sciences, Mathematics, and Education; and the Malek School of Health Professions. Marymount is a member of the Consortium of Universities of the Washington Metropolitan Area, which allows students to take courses at any of the other 13 member institutions and to borrow books from their libraries. Marymount's main campus is located on 21 acres (85,000 m2) in the North Arlington area of Arlington, Virginia. The campus includes six residence halls: Rose Benté Lee Ostapenko Hall, Rowley Hall, Butler Hall, St. Joseph's Hall, Berg Hall, and Gerard Phelan Hall; three academic buildings: Rowley Academic Center, Caruthers Hall, and Gailhac Hall; St. Joseph's Hall computer labs; the Rose Benté Lee Center, which includes two gyms, Bernie's Cafe, mail facilities, and recreational and meeting spaces; the Gerard Phelan Cafeteria; the Emerson G. Reinsch Library and Auditorium; the Lodge; Ireton Hall; the Main House; the Chapel of the Sacred Heart of Mary; and the synthetic-turf practice field. Marymount's Ballston Center is 2 miles (3.2 km) away from the main campus in Arlington and houses the School of Business and Technology as well as select programs of the School of Sciences, Mathematics, and Education, and the office of Graduate Enrollment Services. The center also includes the Cody Gallery, Eats Café, Coakley Family Library, computer labs, chapel, conference center and auditorium. The Ballston-MU Metro Station is within walking distance from the Ballston Center. Additionally, free shuttle services operate between the Ballston-MU Metro Station, Main Campus, 4040 Center and Ballston Center. Marymount's 4040 Center houses its physical therapy doctoral program and MedStar Clinic. The clinic, a partnership between Marymount and MedStar NRH Rehabilitation Network, provides physical therapy services to the community while allowing for an enriching environment in which Marymount physical therapy students gain valuable clinical education experience. The 4040 Center location is just minutes from the Main Campus and within walking distance of the Ballston-MU Metro Station. Students travel to and from locations on free Marymount shuttles. Marymount's athletic teams, known as the Saints, compete in NCAA Division III in the Atlantic East Conference and sponsor 19 sports. Men's sports include baseball, basketball, cross country, golf, lacrosse, soccer, swimming, tennis, track, and volleyball. Women's sports include basketball, cross country, golf, lacrosse, soccer, swimming, tennis, track, and volleyball. After nearly 29 years as a founding member of the Capital Athletic Conference, Marymount joined with six other institutions in the region to form a new league, the Atlantic East Conference, which received NCAA approval to begin competition on September 1, 2018. In 2018, a record 48.9 percent of Marymount student-athletes were named to the Capital Athletic Conference All-Academic Team. Additionally, 31 student-athletes earned a spot on the Academic Honor Roll of the Eastern College Athletic Conference (ECAC), and 42 were placed on the ECAC President's Honor Roll. Marymount also offers recreation and intramural programming throughout the year. A variety of fitness classes are offered free to student, faculty, and staff. Intramural offerings include basketball, volleyball, soccer, ultimate frisbee, kickball, wiffleball, and canoe battleship. An expanding club sport program includes Cheer, Dance and eSports. In the fall of 2019, Marymount will host its first competitive eSports program in the new gaming arena. Marymount University has over 40 clubs and student organizations. Most are managed by the student-led Co-Curricular Council (CCC) with the assistance/advisorship of the Office of Campus Programs and Leadership Development (CPLD), while other organizations like the Student Government Association fall under the advisement of other university offices. Many departments on campus offer specialized clubs based on academic interests, like the Fashion or Psychology clubs, which fall under the purview of those departments. Students may join groups dedicated to community service or philanthropy like the Campus Ministry Association, and the Global Charity Project or participate in a career-related club like the Fashion Club, Interior Design Association, or Students for Free Enterprise. The Student Government Association, Co-Curricular Council, Association for Campus Events, and Marymount University's student-run newspaper The Banner provide students with additional campus leadership opportunities. Each year, Marymount students provide more than 16,000 hours of service in the local and global community. From tutoring children, providing health-assessment services, conducting food drives, and cleaning up parks to building a chapel in the Dominican Republic or raising funds for a well in Sierra Leone, Marymount students actively seek out ways to make a difference. In 2018, Marymount University established the Saints' Center for Service to implement a framework for sustainable service programming. The Center supports, promotes and coordinates service opportunities across campus, leveraging Marymount University's commitment to service and providing further opportunities for Marymount's students and faculty to work together on service projects, both inside and outside the classroom. #2 for Campus Ethnic Diversity. Named 2017 Educator of the Year by The World Affairs Council, Washington, D.C.
^ As of June 30, 2017. "U.S. and Canadian Institutions Listed by Fiscal Year 2009 Endowment Market Value and Change in Endowment Market Value from FY 2016 to FY 2017" (PDF). 2017 NACUBO-Commonfund Study of Endowments. National Association of College and University Business Officers. Retrieved February 8, 2018. ^ "Marymount University - History". www.marymount.edu. Retrieved 2015-08-25. ^ "Atlantic East has name, formal announcement". D3Sports.com. March 1, 2018. Retrieved September 7, 2018. ^ "Saints Flourish In Classroom, Proven Through Record Placement in CAC All-Academic and ECAC Honor Rolls". Marymount Saints. June 25, 2018. Retrieved September 7, 2018. ^ "Marymount University - Campus Programs & Leadership Development". marymount.edu. Retrieved 1 October 2015. ^ "Marymount University - Student Government Association". marymount.edu. Retrieved 1 October 2015. ^ "Campus Ministry". Marymount University. Archived from the original on 2007-12-12. Retrieved 2008-07-03. ^ "Global Charity Project". marymount.edu. Retrieved 1 October 2015. ^ "Marymount University - Community Engagement". www.marymount.edu. Retrieved 2015-08-24. ^ "Most International Students, Regional Universities South". U.S. News & World Report. September 10, 2018. Archived from the original on 2017-05-20. ^ "Campus Ethnic Diversity, Regional Universities South". September 10, 2018. Archived from the original on 2017-05-20. ^ "Best Value Schools, Regional Universities South". U.S. News & World Report. September 10, 2018. Archived from the original on 2018-06-12. ^ "Best Colleges for Veterans, Regional Universities South". U.S. News & World Report. September 10, 2018. Archived from the original on 2018-06-12. ^ ""Marymount Cybersecurity Program Rising in U.S. News & World Report Ranking."". Marymount University. January 9, 2018. ^ "Top Online MBA Programs in Virginia". Online MBA Today. September 5, 2018. Retrieved September 7, 2018. ^ "Marymount Named Military Friendly School for Eighth Consecutive Year". Marymount University. March 5, 2018. ^ "Marymount Honored by World Affairs Council". Marymount University. April 4, 2017. This page was last edited on 26 March 2019, at 13:52 (UTC).